Macy’s is giving away a complimentary tote as a marketing product with any large spray purchase from the Juicy Couture fragrance collection. This tote bag is limited to one per customer. So hurry up and get yours today, while stocks last! Juicy Couture is a contemporary casual wear and dress clothing seller based in California. In recent years, Juicy Couture has transformed itself into a global seller with their signature velour tracksuits and other items like fashion accessories and perfumes. 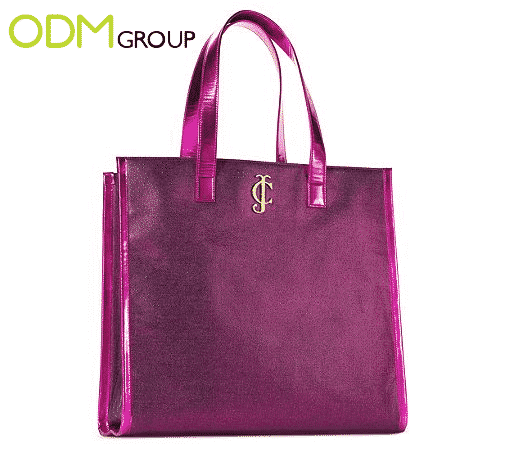 Why offer tote bags as marketing products? Tote bags are a great staple for any season and have high utility value. The tote bag offered by Juicy Couture is large and spacious making it suitable for carrying a large number of items. The simple yet classic design of the tote also makes it highly suitable for use everywhere! One can take it to the mall, to dinner, to school, the usage possibilities are endless! Using tote bags to boost your branding! 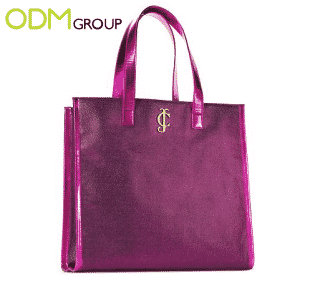 The Juicy Couture tote comes in a gorgeous shade of fuchsia color and is perfect for stylish individuals out there. The loud and bold color is attention grabbing and will attract many to stop and take a look. This marketing product serves as an excellent tool for advertisement that will boost brand recognition. By having “JC” in gold hardware on the tote bag, Juicy Couture has successful branded the marketing gift. This method of branding is subtle yet highly effective! The subtleness of the branding might garner the interest of others and lead them to research about the brand. Whereas for the regular customers, they will be reminded of Juicy Couture when they come across the tote. This method of branding marketing products will definitely help to generate sales for the company.